It has begun. The planning and dreaming and not quite yet stressing about our summer trip to Paris. We had guide books out yesterday, y'all. So what I want to figure out first, and plan my whole trip around (for now), is a day trip out of Paris to cross a border. Yes, I'm beginning my Paris-trip-planning by investigating trips out of Paris. It may seem weird, but that's where my mind is going so I'm running with it. In all honesty, it's probably my function of my lust for new places. Paris is a repeat for me, and as much as I love the city, I'm eager to add a new place to the agenda. The Boy has some major catching up to do as far as his country-count, so this will help him, and I just hate to go all that way and not add to my tally. Being that France borders a whopping 6 countries, plus a watery border with the UK, we have several options. But given that we want to take the train, and not spend really more than a day or day and a half, we're reasonably limited to the following countries: Belgium, Luxembourg and Germany. This is the option I'm leaning towards already. I think after bustling Paris, it would be nice to spend a day in Bruges, a notoriously charming town with a fairy-tale vibe. I mean, just look at that main square! Called "The Venice of the North," the city of Bruges seems to huddle merrily along the banks of it's many winding canals. If the real Venice is one of my world-wide favorites, why not try it's northern namesake? Attractions? Museums, quaint stores, and enough chocolate shops to make one sick (49 to be exact. But really what attracts me to Bruges is not the plethora of historic sites or gasp worthy Flemmish artworks, it's the ambiance of the place. It looks so quaint and quietly cheerful that I just want to row a little boat down the canal and wave to all the passersby. While on the canal, I would also like to stay in the floating De Barge Hotel, a second life boat docked on the canal at the center of town. Find the NY Times recommendations here and drool over twice fried french fry reviews. Update: Do you read Hi Sugarplum? It's super cute and she has a nice review of Bruges as well. All signs point to this cute city, but I'm still researching! Would you consider doing a post about airport security (specifically the TSA)? I hear so many horror stories on the news that it makes me not want to fly (especially with my kids). I'd love to hear from someone who has traveled a lot. Yes, Bruges!! I loved it. It is pretty small, so it's definitely doable in a day. But it's just such a cute town to walk around. I would also recommend the boat ride on the canals! And even though the chocolate is expensive, it's worth it. I went around Halloween a few years ago, so I had to stock up on my candy supply. And a lot of shops had really cool themed chocolate sculptures and displays, which were fun to look at. Monkey! Thanks, a personal rec is always appreciated. I almost don't want to look anywhere else bc this seems so perfect! Looks amazing! I think this is a definite go! YES YES YES!!! 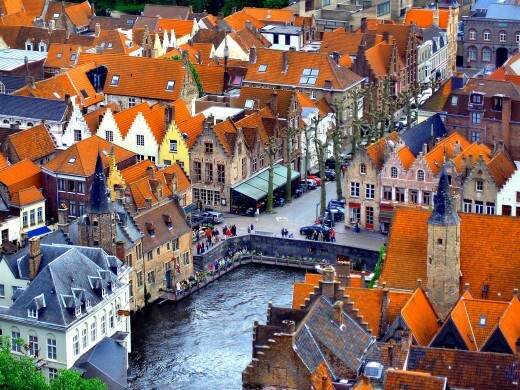 Bruges is a must -- one of my favorite towns ever. It's like magic and fairy dust. I dont' know about a day trip from Paris, as you'd have to take the high speed train from Paris to Brussels (@ 2 hrs IIR), then the inner country train to Bruges (1 hr or so). That'd be a lot to go there and back in one day. True it's small and can be seen quickly, but sitting the cafe absorbing it, and strolling the canals at dusk is what's so magical. I'd say spent at least one night. Our hotel was perfect and affordable (and included breakfast!). Eat the chocolate, have a waffle, take the canal trip via boat. Enjoy!! assert it. You are making it entertaining and you continue to take care of to keep it sensible. I can't wait to learn much more from you. That is really a wonderful site.